No longer is the game just about a starting XI; the substitutes play a crucial role in defending a lead or winning a game. 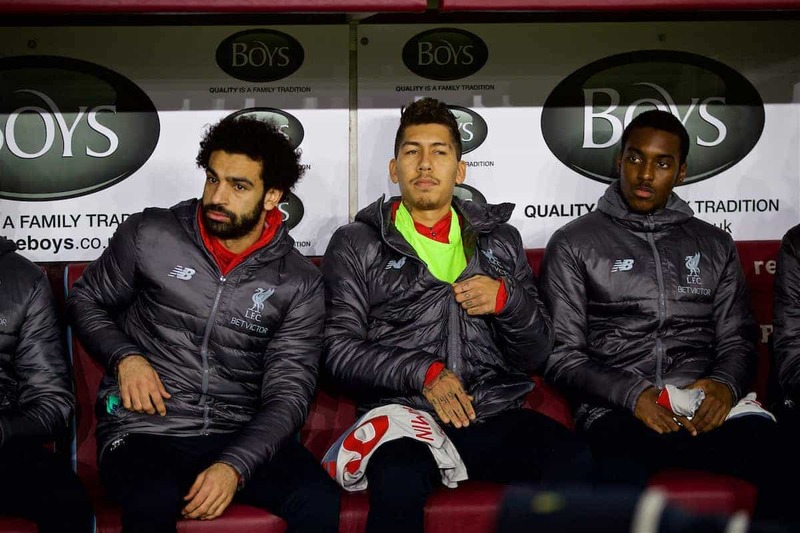 How do Liverpool make use of the bench, and what has been the habit of Jurgen Klopp compared to others? 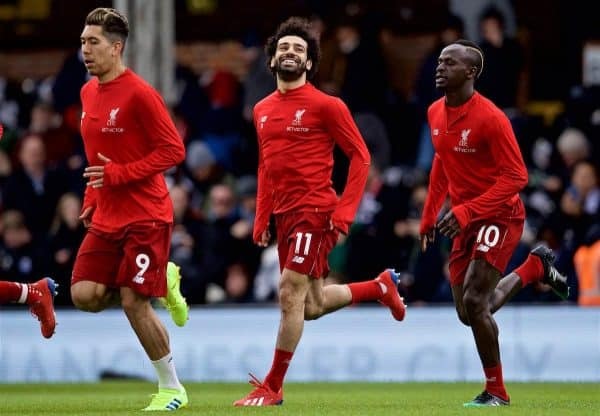 In previous campaigns, a criticism of the Liverpool squad has been that while the first-choice lineup might be impressive, there hasn’t been the depth to challenge. Sub options, rotation players and impact names off the bench have been absent all too frequently, leaving the Reds struggling through injury crises or unable to last the distance in the league. 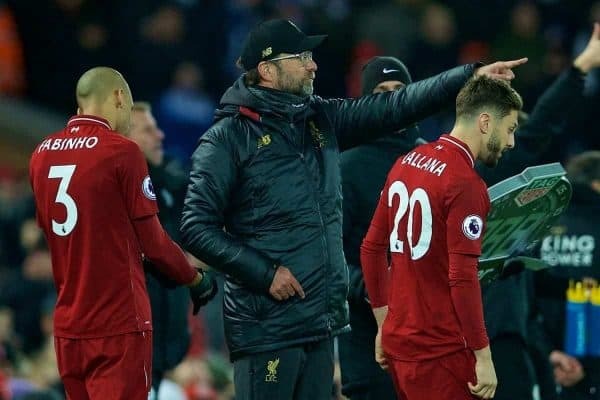 At the start of this term that seemed to be no longer the case, but as the season has worn on, Klopp has more frequently turned to the same small group of players to play a major part. Here we look at how his subs have been used, who has been withdrawn before the full 90 is up and how the Reds’ key men compare to rival teams’ star players. There’s not much surprise with the area of the pitch which gets most attention from Klopp and his in-game changes: the attack. This tends to be the case for most teams, along with the midfield lines—essentially, those who either do the most running or are tasked with finding a route to goal and can be taken off when having a less-effective day. In fact, Firmino is way out in front: he’s taken off in precisely half his appearances for the Reds, compared to just 34 percent for Mane and 29 percent for Salah. 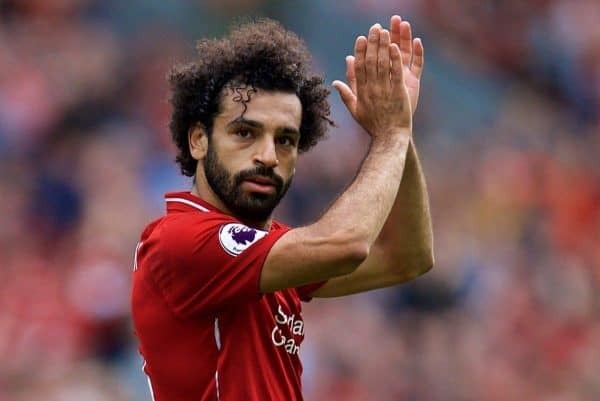 In turn that has an impact on the Brazilian’s total game time; while he has made the second-highest number of appearances this term—40 to Salah’s 41—the No. 9 is only seventh in the squad for minutes on the pitch (2,850). 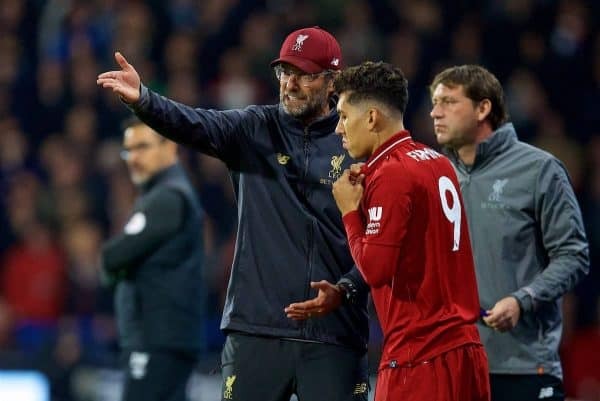 There’s no question this is a deliberate ploy of the manager’s, who has previously suggested Firmino needs to be saved from himself given his relentless work rate and selflessness on the pitch. Nobody particularly wants the tag of super sub, but just as some players are undisputed starters, some have to be capable of impacting off the bench. In perhaps the first third of the campaign there was a clear hierarchy: Joel Matip was the defensive reinforcement, Xherdan Shaqiri the attacking option. Both have since won themselves a starting spot as a result of impressing or injury—the Swiss winger has gone on to lose it again. It’s perhaps also worth highlighting that Sturridge has been an unused sub on 17 occasions this term, showcasing just how much of a watching brief he has had in 2018/19. The only two players who have been unused subs more often are backup goalkeeper Simon Mignolet (38) and left-back Alberto Moreno (19), rarely a player Klopp turns to at all. 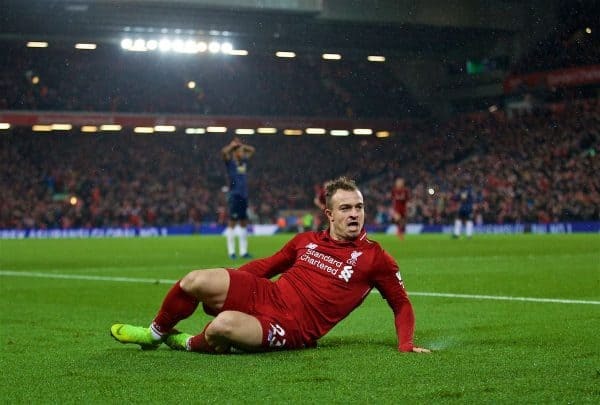 In terms of impact, it’s Shaqiri who has been best for the Reds in an attacking sense: three goals and an assist as sub is bettered only by Pierre-Emerick Aubameyang (four goals, one assist) in the whole of the Premier League. Sturridge has managed two goals and an assist himself, while Fabinho, Firmino and Divock Origi have all also scored off the bench. At the other end it’s more difficult to tangibly define ‘impact’ but Matip came on five times in the closing stages of league games by mid-November; only one goal was scored against the Reds after his introduction (Spurs away) and zero points were dropped once he was on the pitch. Of course, in mitigation of that, there were occasions he only came on for seconds or a couple of minutes, even if there was only a one-goal lead (or draw) to protect. Time to combine the two and see who plays the biggest bit-part role for the Reds. By the raw numbers, it’s tempting to see those players as the ones Klopp either doesn’t feel can contribute 90 minutes week in, week out. But the names don’t make sense—Firmino is arguably his most important tactical component of the team. And this provides a much more realistic insight into who offers what to the team. Lallana has yet to complete a single 90-minute outing for the Reds, by virtue of both injury and inconsistency. 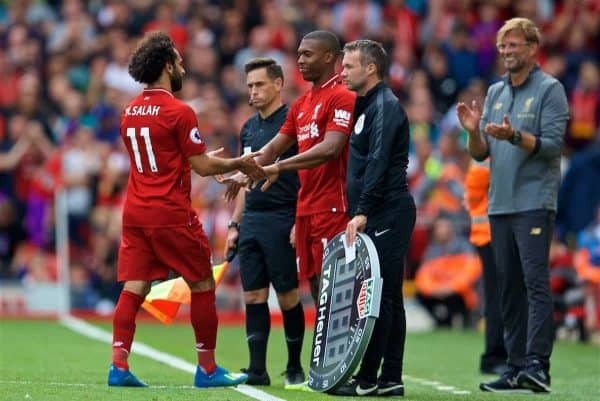 Sturridge is the go-to sub, so naturally he features highly, while others such as Shaqiri and Keita have been genuine squad options this season: bedding into a new team, adding depth, trying to establish themselves. It’s an intriguing detail as to who Klopp values not just as a starter, but as a regular player. Henderson and Milner feature in the earlier lists, subbed on or off, but they play a huge volume and the boss has no qualms with keeping them on if they are doing well or they suit a particular tactical need. One final area left to consider is how Klopp’s management of the front three differs to those of other coaches. 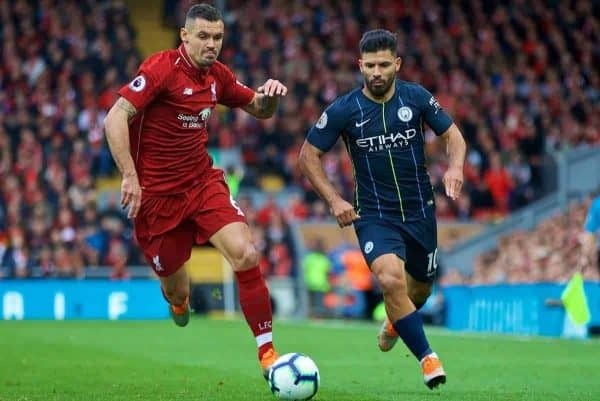 Man City‘s Sergio Aguero comfortably comes out on top as the most subbed key attacker (on or off); perhaps not a surprise given City have another very good option in Gabriel Jesus. 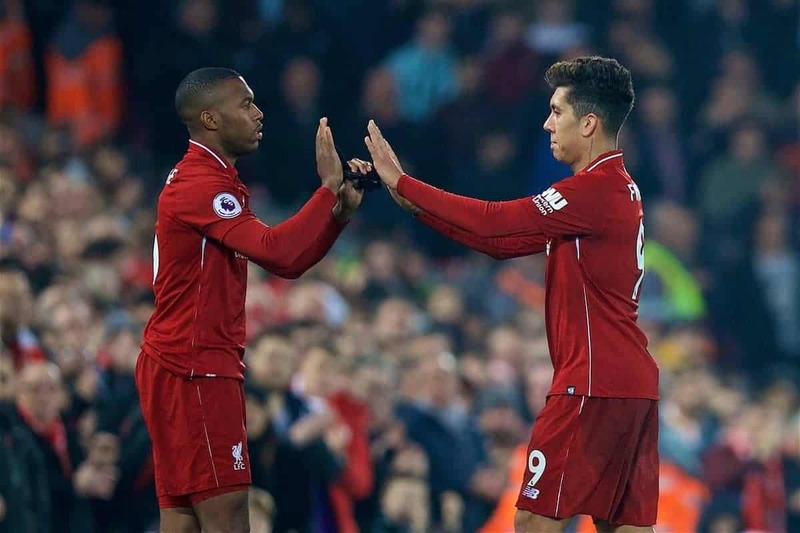 Firmino (68 percent) is equal to Marcus Rashford, though the Man United man comes on as sub more frequently than Bobby, while only Spurs’ Harry Kane gets removed or introduced less than Mane or Salah (both 37 percent). Percentages alone don’t tell the full story of course—in the league we often see Firmino subbed around the 70 to 75-minute mark, whereas Hazard, until recently, was only withdrawn in the closing moments of matches. But it’s perhaps evidence as to the consistency of the front three of Liverpool (even amid perceived downturns for individuals and the collective), the secrets behind keeping them on the pitch as often as Klopp has done and why they remain so key. Mane’s form has been relentless of late, while Salah’s goals earlier in the season really ignited the title challenge. And Firmino remains central to it all, as is evidenced by the lengths Klopp is willing to go to protect his No. 9, even from his own attributes which make him such an important player. The challenge now is for some of the regular group of subs to make themselves starters, for those who rarely complete 90 minutes to improve their own consistency and for those who are subbed off to continue to accept it’s a squad game, and a long-haul one at that. So far so good, and those coming off the bench in the final weeks of the season still have a vital role to play.